The weaning process begins at 4-5 weeks, when the babies begin to ingest good & bad bacteria. Some of this bacteria will become part of their normal gut 'Flora', while other bacteria may be potentially harmful. In the intestine, the babies pH levels are also changing. During this time the babies will still be feeding of their mother, and will be ingesting many of their mother's antibodies. These antibodies help the babies to kill harmful pathogens and bacteria, that the babies have ingested from their environment. The pH levels of the mother's milk are also changing in tune with the pH levels of the babies intestines. The babies need 8 weeks to fully wean from from their mother. This time is needed for the sufficient establishment of a healthy immune system. If a baby rabbit is taken from its mother and not given a full 8 weeks to wean, it will suffer a very high risk of Enteritis. This debilitating disease will cause an inflammation of the intestinal lining, and will result in a fatal diarrhea. This risk of Enteritis is further increased during periods of stress, such as the trauma of re-homing or sudden change of food supply. 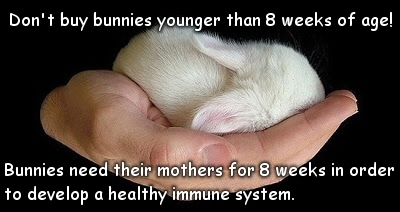 Be a responsible adopter, and do not allow a bunny to die simply because it is "cute" at 4 weeks. Baby Bunnies deserve the chance to grow up healthy and happy, give them the best possible chance in life and wait until they are 8 weeks old before removing them from their mother. Rabbits can NOT tolerate heat! A hot rabbit = a dead rabbit. 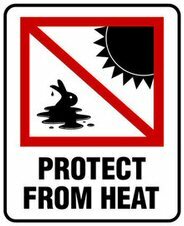 If you are keeping your rabbit indoors, in the a/c, he or she will be fine. If you are keeping your rabbit outdoors: Keep in a shady area. On days over 76 degrees, provide your outdoor rabbit with a fan. On days over 86 degrees, provide your rabbit with a frozen bottle in addition to a fan. Depending on the size of your rabbit, you can use a frozen water bottle, or a frozen 2 liter bottle for your rabbit to lay against. A frozen 16oz bottle works great for single small and medium rabbits. A frozen 2 liter bottle works great for large rabbits, and does with kits out of the next box. This will help your rabbit to lower their body temperature. Heatstroke is considered a medical emergency and without treatment, can lead to the death of a rabbit. Signs of heat stress include panting along with flaring of the nostrils as the rabbit breaths. When the body is unable to cool down, the body temperature rises leading to heatstroke. The signs of heatstroke include heavy panting, salivating, confusion, inability to move and the rabbit may have convulsions. The rabbit's body will reach a point where it can no longer function which leads to the death of the rabbit. Please do your research for your particular breed. Make sure it has adequate space. 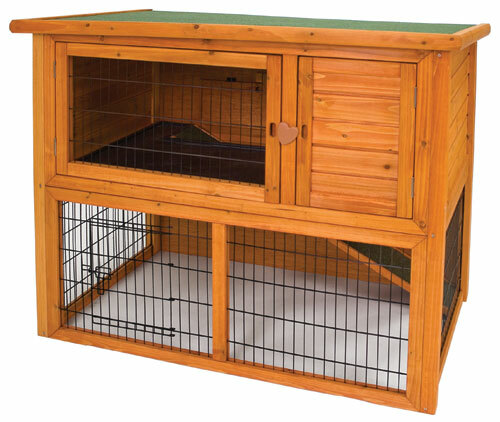 If kept outdoors, make sure it has a secure, predator proof enclosure with protection from the weather. The minimum recommended sizes that you find on the internet are for rabbits that will have a lot of out of their enclosure play time. If they will primarily be in their enclosure, it needs to be larger than the minimum recommended size. If your rabbit is being kept on wire, make sure that it has an area to get off of the wire to rest its hocks. I do not recommend keeping more than one rabbit in an enclosure, rabbits can be VERY territorial. Your rabbit will not get lonely. Rabbits are solitary animals and prefer to live alone. You rabbit will play with toys, and you don't have to buy them. Rabbits enjoy the following: pine cones (make sure they are from a yard that is not treated with pesticides or chemicals), empty toilet paper/paper towel rolls, newspaper, cardboard boxes, notebook/printer paper, and paper bags. Rabbits love to toss pine cones and empty rolls around! They also enjoy scratching and shredding cardboard and papers. Give them some newspaper, or some wadded up sheets of notebook or printer paper and watch them have fun! If you feel you must purchase toys, make sure to purchase toys made specifically for rabbits. This will help to ensure that they do not contain any woods, chemicals, or dyes that can be harmful to your rabbit. Provide your rabbit with fresh water at ALL times. Inspect your rabbit's water bottle daily to make sure that it is working properly (not clogged/stuck/leaking/etc). I do not recommend water bowls, they can lead to a condition known as "wet dewlap". Allow your rabbit unlimited access to a pelleted food made specifically for rabbits. Most commercial pelleted rabbit foods on the market are complete with vitamins and minerals already added. Try to find one with a protein content of about 16%. Don't buy more than your rabbit will consume in 3 months, and keep stored in an airtight container. Make sure that your rabbit's food dish stays clean and dry, and filled with fresh food. Make sure that your rabbit's food does not get moldy. Make sure your rabbit has unlimited access to a fresh grass type hay. This is good for fiber as well as tooth care. Rabbit's teeth never stop growing, chewing on hay helps to file them down. If they are allowed to continue to grow, it can lead to malocclusion, which can be fatal. Acceptable grass type hays are timothy, orchard, and coastal. I do not recommend Alfalfa, which is a legume. Alfalfa hay is high in protein and calcium, which can lead to obesity, and kidney and bladder problems. Some people feed alfalfa hay to their pregnant and nursing does, and kits under 7 months of age. I prefer to just avoid it altogether. Make sure that your rabbit's hay does not get moldy. Treats are unnecessary, if you feel you must give your rabbit treats, please try to wait until your rabbit is at least 6 months old, and please do your research. There are plenty of lists of acceptable treats to be found online. 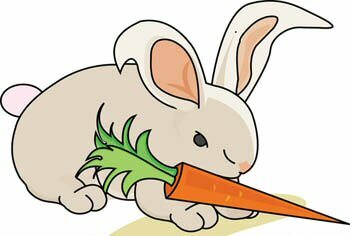 NEVER feed your rabbit chocolate, rhubarb, citrus peels, onions, or raw lima/kidney/soy beans. These can be toxic. Try to avoid the following: beets, breakfast cereals, corn (and all other grains), fresh peas, green beans, iceberg lettuce, legumes, nuts, potatoes, seeds, starches, and sugar. If your rabbit is free range, be sure to research a list of plants known to be toxic to rabbits. If you have a garden, make certain that your rabbit can not access it. The leaves and stems of many common garden vegetables are toxic to rabbits.